The August 2014 Scanfest will take place here at AnceStories this coming Sunday, August 24th, from 11 AM to 2 PM, Pacific Daylight Time. It will be held one week early due to the Labor Day holiday weekend. Twenty months ago, I started out on an adventure. It was--like all adventures--difficult and challenging at times. But it also was rewarding and self-improving and well worth my investment of time and effort. I'm talking about ProGen: a formal, online book study course on the text Professional Genealogy: A Manual for Researchers, Writers, Editors, Lecturers, and Librarians, edited by Elizabeth Shown Mills (Baltimore: Genealogical Publishing Company, 2001). This course involves nineteen months of reading, research, and writing assignments, providing feedback to your cohort's assignments (and accepting it from them on yours), as well as a monthly chat with your cohort, coordinator, and a mentor who is a BCG (Board for the Certification of Genealogists) certified genealogist. So why did I take this course? What all is involved? What are the benefits? What is the outcome? And where do I go from here? First of all, I wanted to explore the possibility of becoming a certified genealogist through BCG. While I have had no formal training in genealogy, I have learned the research process through over twenty years of research experience, reading lots of how-to texts, and listening to lectures at conferences, in webinars, and on audio cassettes. Well-known genealogy courses available online through Boston University were not affordable for me, but I wanted something more involved and advanced than the excellent-but-basic National Genealogical Society's Home-Study course. I knew from ProGen's course description that there would be a focus on the business aspects of being a professional genealogist, something about which I was fairly ignorant. So I made my decision to go with ProGen. I started blogging about ProGen in The ProGen Study Group: Getting Started and The ProGen Study Group: Lesson One. There's a lot of good information in those posts which I won't repeat here, but which give you an idea of the intensity of the program. However, I decided not to continue posting about ProGen for several reasons. First of all, my time spent in blogging was getting eaten up pretty quickly by my ProGen assignments. Truly, you need to give yourself a good twenty hours a month to get it all done, and sometimes that wasn't enough! Secondly, I realized that giving too much detail about the program was not a good idea, ethically. Someone could take that information and create their own course. I will give you an overview of some of the major projects, and my favorites. One of my favorite projects was compiling a list of our genealogy library (books, CDs, and other resources), as well as a wish list. We could present these lists in any type of format or media. Some chose to do it through Good Reads, some did Excel spreadsheets, while I chose my presentations as two Pinterest boards, here and here. Another fun project was creating locality guides for our geographic areas of research, local or ancestral. These included libraries, archives, courthouses, cemeteries, universities, genealogical and historical society collections, and any other research repositories in those areas. 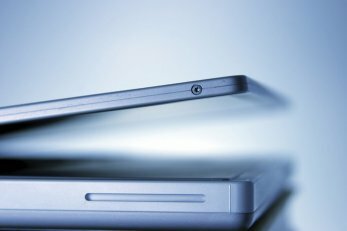 The guides listed details such as physical addresses, websites, contact information, hours, access restrictions, and practical considerations, such as nearby restaurants and hotels for out-of-town researchers. These guides have been compiled into an online list to which ProGen alumni have access for future projects. Oddly enough, the toughest assignments were also my favorites. Some of them required two months to complete, with the first draft due one month, and a final draft due the next. However, they required me to dig deep into all the skills and knowledge I have thus far acquired, as well as challenged me to provide solid evidence for every assertion I made. Some of these assignments included research plans, proof arguments, and one-generation family narratives. You can read mine online at Google Drive. Please note that Google Docs do not always keep the same formatting as Microsoft Word when being uploaded to Drive; therefore, some of these may look "funny" when viewed online. As I've already mentioned, ProGen challenged the way I had done things before. I couldn't simply rely on my memory or toss around probable factors. I had to stick with the facts and have them in order, use logic and reason, and come to sound conclusions. If I didn't, members of my cohort could easily pick apart my theories and conclusions. The cohort itself was one of the biggest benefits of the course; I had a group of people who, while having my back in supporting me through the course, weren't going to accept anything less than quality when it came to evaluating my assignments. I felt safe with their constructive criticism, and reciprocally, I knew they didn't think the worst of me when I pointed out their errors or asked for better evidence to support their conclusions. It's nice to know I can contact them again to ask them to be a second pair of editor's eyes for a research report or family narrative for a client. Meeting once a month with our mentors was also helpful. We could ask questions about their career experience or for help when we just didn't understand an assignment. There are a lot of positive results that I brought away from ProGen. The first is having a better understanding of the business end of genealogy, such as contracts, mission statements, business plans, etc. Professional genealogists spend only a portion of their time doing research. A great deal of time is spent on business paperwork, such as client letters and contracts, as well as the writing of research plans, proof arguments, and research reports. Many of the projects showed me where I lacked organization in my office or computer files for my own personal research, citations, or even the sources of where I had obtained my resources, documents, and photographs. Some of the assignments took much longer than they should have, because I had to put those things in place before I could even get started on the project. This has motivated me to start spending good chunks of time going through my office and computer files and my genealogy software to put those pieces in place. It has caused me to slow way down on the "research" part and spend more time on analyzing the information contained in those documents. The most wonderful result of this is that I have found many more clues to help me toward breaking down some brick walls that have stumped me for years. I've also found details to help flesh out my ancestor's lives and understand more of what they were like, personally; eradicating what I call the "telephone-book genealogy" of boring lists of names, numbers (dates), and places. I was fortunate to have read a how-to-genealogy book years ago that emphasized keeping track of where I got my information. While it didn't teach how to formally cite sources, I did keep fairly good notes. Now it's important to me to put these notes into correct citation format, so that they are ready to use in formal genealogy documents such as research plans, proof arguments, research reports, or family narratives. It also will save me tons of time to help me be able to analyze the quality of evidence, as to whether it is original or derivative, primary or secondary, direct or indirect. It requires a huge amount of time to front load this, but definitely is worth it in the end. The most important result of this course was to realize how much more I have to learn in this amazing field of genealogy, which seems to be constantly expanding in its depth and scope. Yet, it's perfectly acceptable to celebrate what I have accomplished thus far in my journey. One of my early assignments was writing an education plan. Some of the things on that list included attending institutes such as GRIP (Genealogical Research Institute of Pittsburgh), SLIG (Salt Lake Institute of Genealogy) and/or IGHR (Institute of Genealogy and Historical Research) at Samford University. Eventually, I would like to attain my certificate in genealogy through the BCG. However, I have created some personal financial and non-genealogical career goals that must have priority for the next five or six years. These will allow me to have the freedom to pursue the above genealogical goals without hindrances later. In the meantime, I'll continue to monitor and participate in groups like the Transitional Genealogist Mailing List, and the Resources for Professional Genealogists group on Google+. I'll join groups like the Association for Professional Genealogists and the Genealogy Speakers Guild. I'll study formal journals like the New England Historic Genealogical Society's Register and the National Genealogical Society's Quarterly. I also would like to do another book study, this time on Tom Jones's Mastering Genealogical Proof. I will continue to give presentations at workshops, seminars, and conferences; teach classes for the Community Colleges of Spokane; and am now taking on clients for research projects. If you are interested in having me speak to your group or do research, please email me, and I will send you a list of my topics or information outlining what my research services entail. You can also email me or comment below with any further questions you have about ProGen. I sincerely encourage you to seriously consider taking this course to enrich, whether to satisfy your curiosity about the business aspects of the profession or to enhance your own personal research strategies and skills. I was thrilled when I read Diane Gould Hall's post on photoduplication requests from FamilySearch, as I have over a dozen ancestors who died in Michigan between 1921 and 1952. FamilySearch has a database without images that includes an index of the Michigan death records for this time period. I had already ordered several death certificates through the state a number of years ago, but I quickly compiled a list of ones I was lacking in order to start my photoduplication requests. Early Saturday morning, July 26th, I ordered my monthly limit of five, which included great-grandfather Howard Merkel YORK (1945); his father James L. YORK (1933); 2nd-great-grandmother Mary J. (WILKINSON) LEWIS (1940); 2nd-great-grandfather Tjamme Wiegers "James" VALK (1922); and 2nd-great-grandfather Geert Aukes "George" TUINSTRA (1928). By Monday morning, July 28th, I had five emails from FamilySearch with the requested state death certificates attached. Boy! did that make my day! 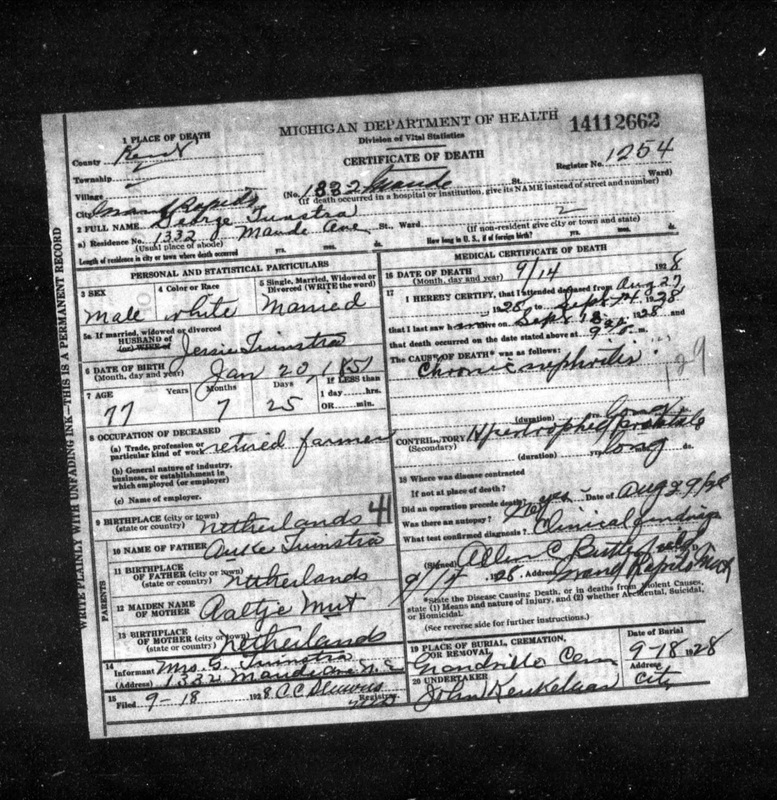 Michigan Department of Health, death certificate no. 14112662 (1928), George Tunstra [sic]; Division of Vital Statistics, Lansing. FHL microfilm 1,972,820. Hmm. Upon closer examination of the metadata on the image found in the genealogy folder, I discovered I had downloaded it from the SeekingMichigan site on 15 April 2009. WAIT JUST A DARN MINUTE! 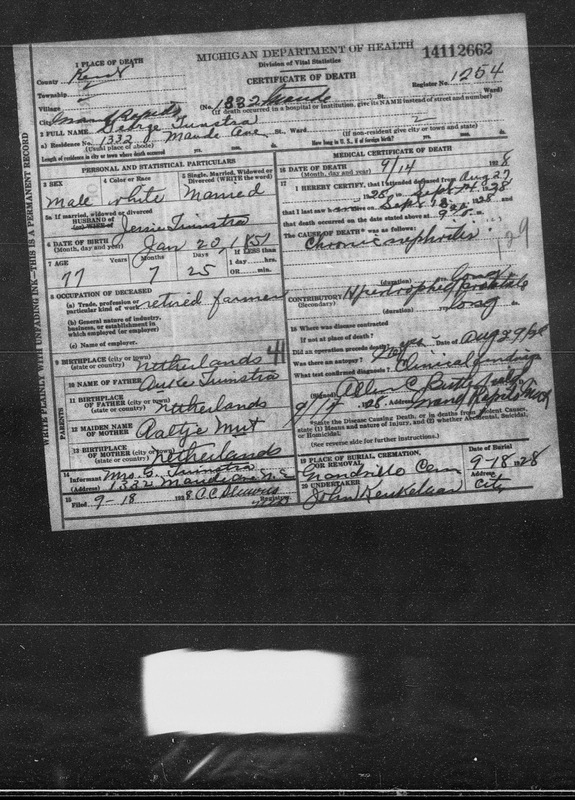 The death certificates at SeekingMichigan are for the 1897 to 1920 time period! How the heck did I obtain a 1928 death certificate from that site? I couldn't tell whether the metadata had automatically come with the image or if I had entered it. I wasn't keeping source citations as well in 2009 as to where I obtained my digital info. Perhaps I had entered SeekingMichigan as the source by mistake. So off I went to SeekingMichigan to see if I could duplicate my search and results. George's last name is spelled "Tunstra" on his death certificate (never mind that Tuinstra is spelled correctly for his wife's and father's names on the same document! ), so that is the name I searched for. Incredibly, his record appeared! Apparently back in 2009, I had done searches on variations of the Tuinstra name to find his relatives who died during the 1897 to 1920 time period, and had come up with his death certificate. I just never thought twice about the date being past 1920. So, was this just an anomaly? Using the Advanced Search feature of SeekingMichigan, I searched for "All of the Words" equaling "1928" in "Death Year." WHOA! One thousand, two hundred ninety-one results, and they all appeared to come from Kent County! Immediately, I turned to my RootsMagic database and did an advanced search (Find) for death dates containing 1928 and death places that contained the words "Kent Co., Michigan." Besides George, there was Raymond VALK the infant son of my great-grandfather and his second wife, so I searched for him in SeekingMichigan. Sure enough, I found his death certificate, after playing with the spelling of his last name (Volk). Next, I started doing advanced searches on SeekingMichigan for various years outside the 1920 time limit. I was only able to come up with 1928 and 1929, both for Kent County, searching from 1921 through 1952. So if you have ancestors or relatives who died during those years in Kent County, go snag those images now, before someone from the state archives reads this post and pulls them offline. I'm fairly sure they're not supposed to be online! ;-) Shhh! 1. Michigan Department of Health, death certificate 14112662 (1928), George Tunstra [sic]; Division of Vital Statistics, Lansing; digital image, SeekingMichigan (http://www.seekingmichigan.org : accessed 15 April 2009). "Mug books" are collections of biographical sketches usually found within county histories of the late nineteenth- and early twentieth-centuries, particularly in the United States. I have been highlighting ancestors or relatives that were featured in these mug books. These sketches come from History of Cortland County [New York], with illustrations and biographical sketches of some of its prominent men and pioneers, edited by H. P. Smith, and published in 1885 by D. Mason & Co., Syracuse, New York. It can be found online at the Internet Archive here. 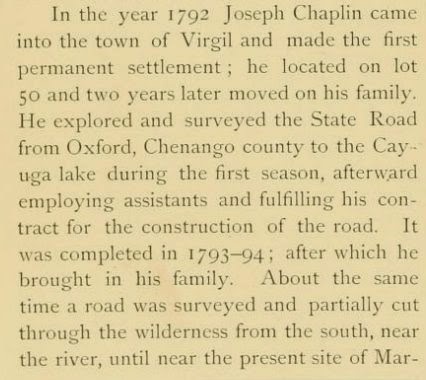 In the year 1792 Joseph Chaplin came into the town of Virgil and made the first permanent settlement; he located on lot 50 and two years later moved on his family. He explored and surveyed the State Road from Oxford, Chenango county to the Cayuga lake during the first season, afterward employing assistants and fulfilling his contract for the construction of the road. It was completed in 1793-94; after which he brought in his family. About the same time a road was surveyed and partially cut through the wilderness from the south, near the river, until the present site of Marathon village, when diverging from the stream, it crossed the south line of lot number 72, about three-fourths of a mile east of the village of Marathon, and continuing in a northerly direction, intersected the State road on lot 42 in Freetown and so passed on northward through the county to the Salina salt works, giving it the name of "the Salt Road." 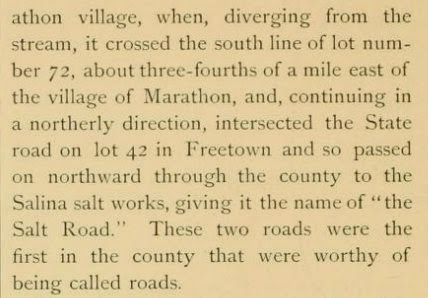 These two roads were the first in the county that were worthy of being called roads. The principal difficulty with which the pioneer had to contend was the absence of roads, mills and markets. The first authorized road in the county was the old State Road alluded to as having been opened by Joseph Chaplin  and finished as far as his contract went, in 1794. 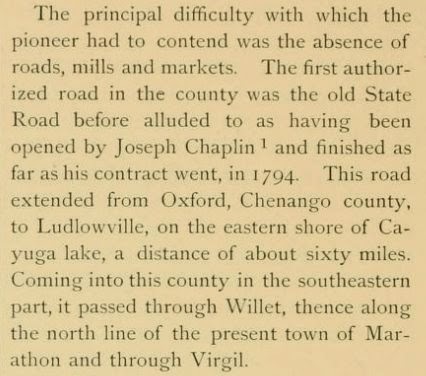 This road extended from Oxford, Chenango county, to Ludlowville, on the eastern shore of Cayuga lake, a distance of about sixty miles. Coming into this county in the southeastern part, it passed through Willet, thence along the north line of the present town of Marathon and through Virgil. 1. Mr. Chaplin was drowned a few years later in the Hudson river at Coxsackie. See history of town of Virgil. To facilitate the settlement of this section of the country, a road was projected, connecting Oxford with the Cayuga lake, to pass through this town. Joseph Chaplin, the first inhabitant, was entrusted with this work. The instrument by which he was authorized to engage in it was authenticated on the 5th of May, 1792. He spent that season in exploring and surveying the route, the length of which is about sixty miles. he came to lot No. 50, which he owned, and afterwards settled, erected a house and prosecuted his work, having a woman to keep the house and cook for workmen. 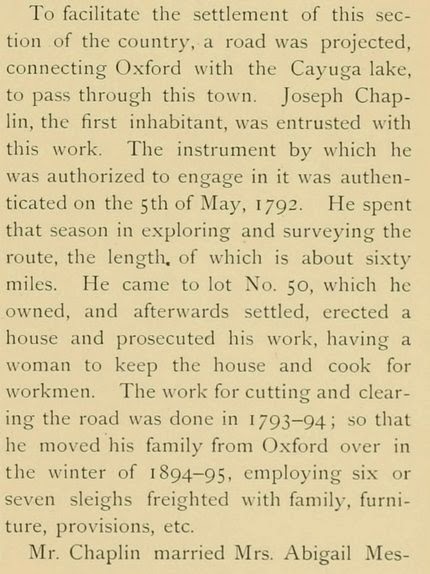 The work for cutting and clearing the road was done in 1793-94; so that he moved his family from Oxford over in the winter of 1894-95, employing six or seven sleighs freighted with family, furniture, provisions, etc. Mr. Chaplin married Mrs. Abigail Messenger, who was the mother of Gideon Messenger one of the pioneers of Virgil Corners, and of Nathan Messenger. By her had three sons and four daughters. His son Joseph married a Miss Chatterton and finally died in the southwestern part of Illinois. He was distinguished in the locality where he resided as a man of intelligence and integrity, was chosen a justice of the peace and a major in the militia, and was familiarly known, on that account, as "Major Chaplin." 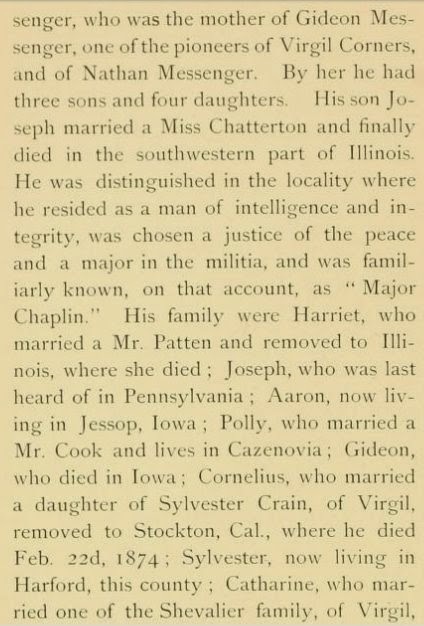 His family were Harriet, who married a Mr. Patten and removed to Illinois, where she died; Joseph, who was last heard of in Pennsylvania; Aaron, now living in Jessop, Iowa; Polly, who married a Mr. Cook and lives in Cazenovia; Gideon, who died in Iowa; Cornelius, who married a daughter of Sylvester Crain, of Virgil, removed to Stockton Cal., where he died Feb. 22d, 1874; Sylvester, now living in Harford, this county; Catharine, who married one of the Shevalier family, of Virgil, and now lives at Macomb, Ill.; and Jacob, now living at Union, Storey Co., Iowa. Daniel Chaplin, the second son of the original Joseph, had a family, but we have not found a record of it. Benjamin Franklin the third son, was father of George A. Chaplin, who now lives in Marathon, and of Walter L., who lives at Messengerville. The daughters were Sally, Ruth, Marietta and Isabella, two of who are still living. Such is a brief record of the descendants of the first settlers of Virgil. This Joseph CHAPLIN, IV (c. 1786-1854) who married Lana CHATTERTON is also mentioned on page 330 of this book as being a captain for the town militia during the War of 1812. Joseph IV and his son Gideon are my children's direct ancestors. 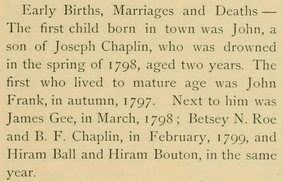 Early Births, Marriages and Deaths--The first child born in town was John, a son of Joseph Chaplin, who was drowned in the spring of 1798, aged two years. The first who lived to mature age was John Frank, in autumn, 1797. Next to him was James Gee, in March, 1798; Betsey N. Roe and B. F. Chaplin, in February, 1799, and Hiram Ball and Hiram Bouton, in the same year. Some of the people in an early day directed their attention to the cultivation of fruit, especially apples. Very soon after his first settlement Joseph Chaplin sowed the seeds for a nursery of natural fruit, and Enos Bouton did the same soon after, and most of the oldest orchards are from these nurseries. Several events have transpired that have caused great sensation for a time, and made a lasting impression on many minds. The first was that of a boy lost in the woods. In May, 1796, Daniel Chaplin, son of Joseph Chaplin, and father of Mrs. Gleason, aged about fourteen years, set out to drive a cow to Mr. Frank, and took with him a few pounds of flour. The cow became refractory and turned out of the road, and in endeavoring to get her back he lost the road and wandered in the trackless wilderness. The cow returned home, thus giving notice that he was lost. An alarm was given and about fifty men assembled, which was a great number for so sparse a population. He was gone four days and three nights without food, and was found on the 'Bridge Road,' in Dryden, by Aaron and James Knapp, of Homer. They ascertained who he was, and proceeded to help him home. He had the flour with him, but the weather having been rainy, it had become mouldy and they threw it away. He was very faint and weak, but being supported on each side he could walk, and they arrived at his father's house about midnight, where his mother had about thirty men in and about the house, and was preparing victuals for them to take in their search on the morrow. Mr. Chaplin was absent at the time. We shall not make the vain attempt to paint the scene caused by his arrival. There is more information on the Chaplin family in this book, mainly about descendants who are not my children's direct ancestors. Also, there are several mentions Chaplin's place, indicating that not only the home located on a major intersection of the humble original road system, but that it was used as a reference point by many of the early settlers. 1. Susan Farrell Bankhead, CG, Lehi, Utah [(E-ADDRESS FOR PRIVATE USE)], to Miriam J. Robbins, e-mail, 5 August 2014, "Joseph Chaplin Blog Post,"; privately held by Robbins, [(E-ADDRESS) & STREET ADDRESS FOR PRIVATE USE,] Spokane, Washington. 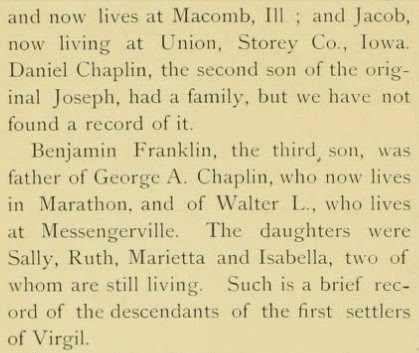 Mrs. Bankhead wrote an article about Joseph Chaplin which was published in the January and April 2012 issues of the New York Genealogical and Biographical Society's Record.